Dobsonian telescopes are an alt-azimuth mounted newtonian telescope design popularized by the amateur astronomer John Dobson starting in the 1960s. Dobson's telescopes featured a simplified mechanical design that was easy to manufacture from readily available components to create a large, portable, low-cost telescope. The design is intended for visually observing faint objects, a requirement where the observer needs a large objective diameter (i.e. light-gathering power) combined with portability for travel to non-light polluted locations. These scopes are intended to be what is generally called a "light bucket" operating at low magnification, and therefore the design omits features found in other amateur telescopes such as equatorial tracking. Dobsonians are popular in the amateur telescope making community, where the design was pioneered and continues to evolve. 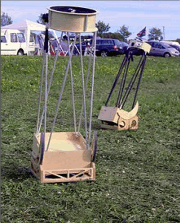 A number of commercial telescope makers also sell telescopes based on this design. The Celestron Firstscope is a good example of a small very portable Dobsonian, whilst on the right you can see a picture of a much larger version on display at Stellafane in the early 1980s. Transporting, setting up, and operating a Dobsonian telescope is simpler than for many other designs. The mount system is compact. 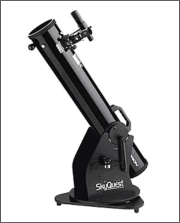 The Dobsonian design of maximized objective diameter combined with portability make the design ideal for observing dim deep sky objects, an activity that requires large objective's and travel to dark sky locations. Because the Dobsonian design is optimized to be a portable, large aperture, inexpensive, deep sky instrument geared towards visual observing, an expensive (and massive) equatorial telescope mount with clock drive was intentionally left out of the design. Instead, with an Altazimuth mount, the user must nudge the scope every few minutes along both axes to compensate for the rotation of the Earth to keep an object in view. The Altazimuth mount also does not allow for the use of conventional setting circles to help in aiming the telescope at the coordinates of known objects. Altazimuth mounts are known for being difficult to point at objects near the zenith, mainly because a large movement of the azimuth axis is needed to move the telescope pointing by even a small amount. Improvements in the azimuth bearing material and design can minimize the problem, but not eliminate it. Equatorially-mounted telescopes have a similar issue when observing objects near the celestial poles. Since the telescope tube is usually fixed in relationship to its altitude bearings, the addition or subtraction of equipment such as cameras, finderscopes or even unusually heavy eyepieces can render the telescope mount unbalanced unless a counterweight or similar modification is added. However, most Dobsonian telescopes have enough friction in the bearings to resist a moderate amount of imbalance. Scopes range from the 12.5" f5 Classic upto the 22" f5 and f4 Classic. Without doubt one of the biggest assets of these scopes is their portabilty.